Home / Articles / 2018 / Hot potato…jumping data! From ‘smart’ potato peeling to wireless network retrofits, J.D Irving’s journey to digital. The complicated, sometimes-confusing, occasionally daunting world of digital transformation can have applications that are downright folksy. Take the application detailed by J.D. Irving’s Martin Davis during his presentation at Smart Industry 2017—a smart potato-peeling machine that is able to autonomously adjust to the nooks and nobs on each spud. Futuristic technology, meet root vegetable. This anecdote was part of Davis’ presentation—“Fewer Wires, More Data: J.D. Irving’s Fast Track to IIoT Deployment”—that chronicled how the Canadian manufacturer’s executives wanted access to a deeper pool of data from their collection of legacy plant-floor automation equipment. They also wanted to avoid the costs of cabling and replacing PLCs and hardware. In short, the company worked with partner RtTech to deploy meshed wireless IIoT technology to connect remote sensors directly to the existing PI system using an embedded data connector, which enables the collection of information using the MQTT protocol and output via various protocols, including direct connection to OSIsoft’s PI. “We were taking a look at the wider plant to see how all elements fit into this picture of digitalization,” explained Davis, the company’s VP of IT. Throughout his session, Davis repeatedly referred to his enterprise’s journey to digital. A shifting mindset, all-encompassing throughout every component of the company, from adopting analytical tools that enable real-time data-processing to reskilling workers, which enables the factories to actually operate. He also addressed a common topic at this conference—assuaging the concerns of personnel who feared this new technology would ultimately supplant them. He noted that after every industrial revolution the number of people employed actually increases. It’s not all gravy, of course. Davis detailed a load of challenges his enterprise continues to face in its digital transformation. Assets do not connect as they should and real-time visibility that isn’t always clear. Poor network quality bedevils workers. Mobile assets are trickier to manage than those bolted to the plant floor. And aging equipment is, naturally, less inclined to be smart than a modern machine. These pain points resonated with the audience. People come to the Smart Industry conference to learn, for sure, but there is also the appeal of hearing others detail their struggles in adopting modern technologies. There is communion in challenges faced. And there is a glint in the eyes of professionals when they learn from a peer a tactic to fix a problem back at the home plant. It’s the new way of using equipment, from forklifts to entire factories. It’s the future of manufacturing. And it’s light-years away from how we used to peel potatoes. Whattya wanna learn in 2018? 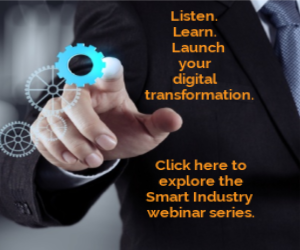 Check out our Smart Industry webinars here.